It’s official, Amazon is coming to Australia, promising cheaper prices, faster delivery times, and access to a greater range of products, including groceries. The suggestion is that existing prices will be undercut by 30%. 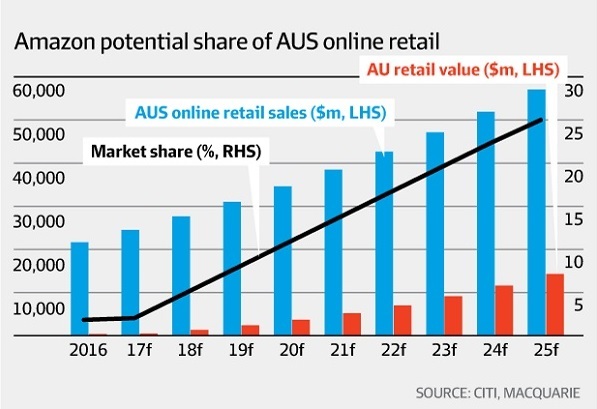 Myer, Harvey Norman, JB Hi-Fi, Supercheap Auto, Big W, Kmart and Target are all tipped to see revenues smashed by as much as 55 per cent over the next five years. 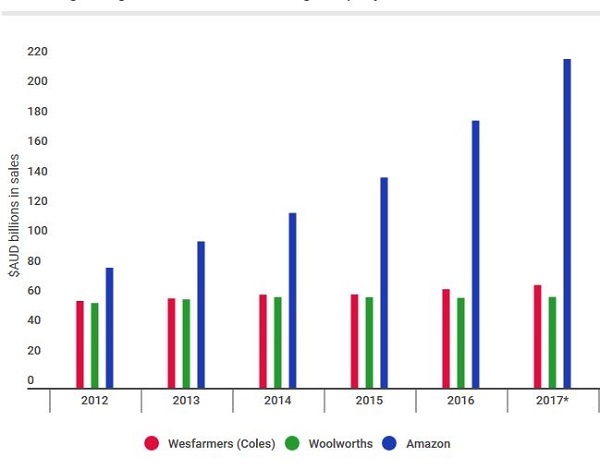 The graph shows 23% annual growth for Amazon, 1.1% for Woolworths, and 4.3% for Wesfarmers. Amazon’s strength includes efficient logistics, where it typically uses third-party parcel delivery firms. 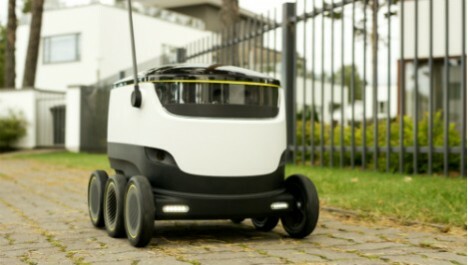 Apparently the plan is to start with one large warehouse ‘fulfillment center’ of 93000 square metres, about five times as large as the MCG, to service the eastern states, opening towards the end of 2018, and is likely to be highly automated. 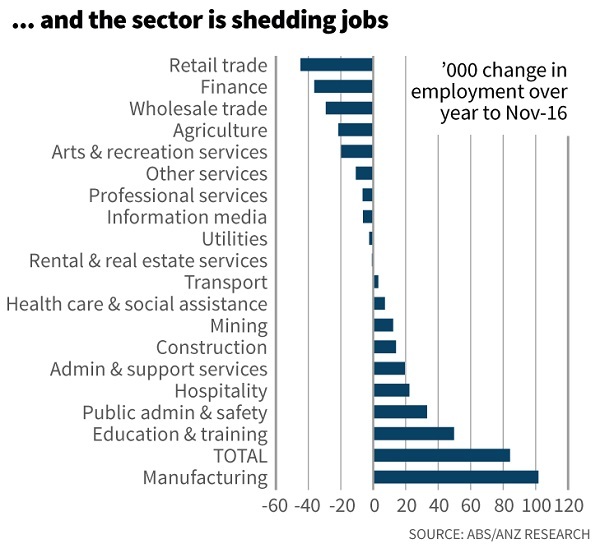 This is happening in a context where retail as an industry sector in Australia is doing it tough. 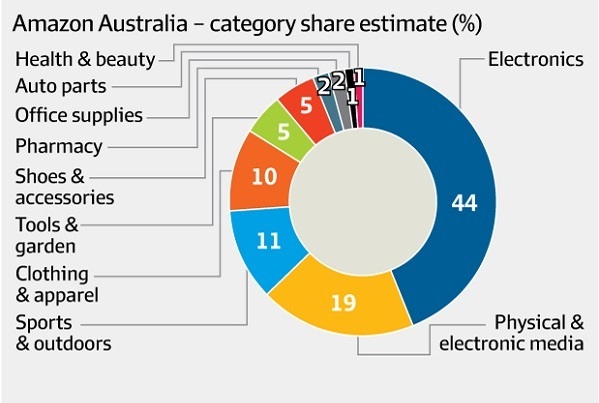 SMH, main coverage here, has a handy article Why retail is so tough in Australia – six graphs that explain the carnage. It has been tough for a long time. Real wages have not been keeping pace with inflation. Employment is increasingly casualised. We pay more to keep a roof over our heads and for utility bills, such as electricity, so one way or another, discretionary spending erodes. There is a myth that because we have two large supermarket chains there is no competition. 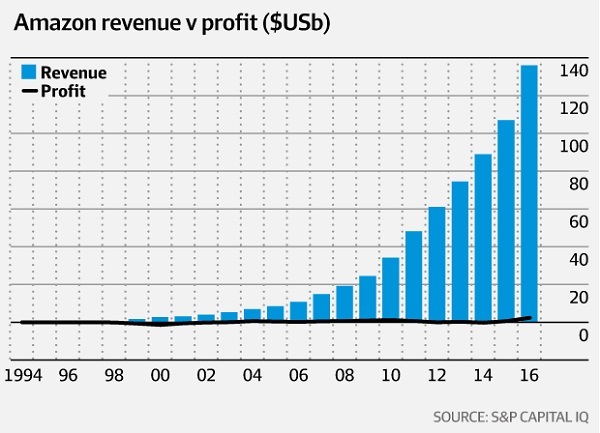 In fact they operate on profit margins of about 2 per cent or less, competing ferociously with each other (the latest is that Woolworths has regained ascendancy). However, in recent year their behaviour is most of all determined by the threat of Aldi. As Amazon chews into physical retail, we can expect more empty shops in strip shopping, and regional centres will suffer. With fewer customers around, cafes and coffee shops will struggle. Amazon is spruiking all the jobs they will bring, but with increased online sales and automation jobs net jobs will certainly go. Several times recently I’ve been into JB Hi-Fi shops. They hum with customers, and with friendly and capable staff. Think of department stores like Myer and DJs now compared with what they were a couple of decades ago. Once there was a buzz there too, now you could fire a canon without hitting anyone. I don’t know how they pay the rent. According to the SMH report JB Hi-Fi expect their sales to be smashed by 29%. wiped nearly $US40 billion off the market value of 20 food and drink competitors in US share trading on Friday. Amazon’s largest bricks and mortar competitor Walmart lost 4.7 per cent, Costco erased 7.2 per cent, SuperValu plunged 14.4 per cent and Target fell 4.4 per cent. 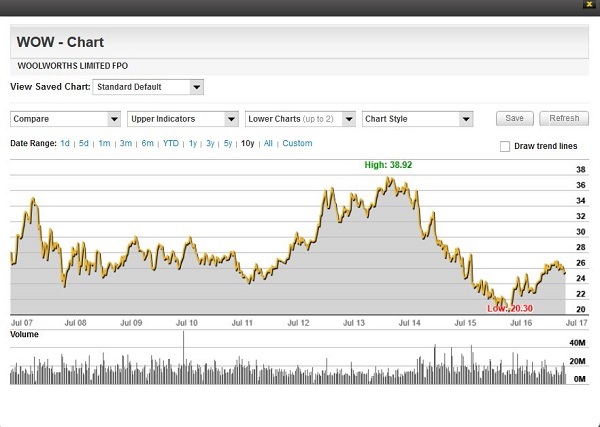 America’s biggest supermarket owner, Kroger, plummeted 30 per cent in two trading days after earlier revealing that sales at stores had declined for the second straight quarter. 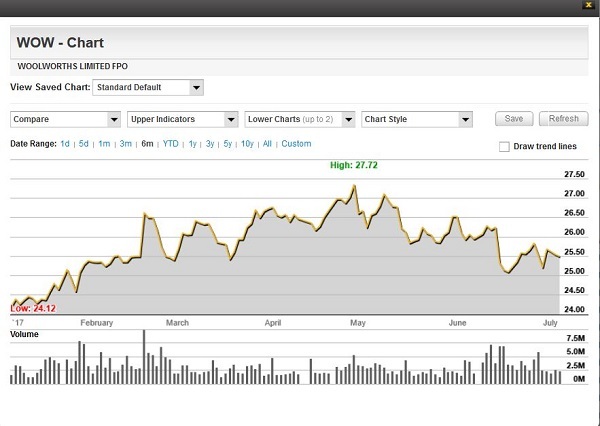 Normally when a company announces a takeover it’s share price goes down to reflect the premium paid to gain control of the target company. Amazon paid a premium, but its shares climbed 2.4 per cent. Amazon is a company that doesn’t make strategic mistakes, according to the market. One way or another, Amazon has the capacity to reshape our shopping experience in ways not necessarily to our advantage, but our guardians will just wave the monster in and let it rip. Almost certainly our free trade agreement with the US would limit our options. In the US, Amazon is well-known for using low paid workers in its warehouses. They do not enjoy the same workers rights that Australians enjoy. One famous story tells of an Amazon warehouse with ambulances parked out the front on hot days. Workers would regularly collapse from heatstroke, but sufficient airconditioning was not in the budget. It also has the attitude, typical of American corporations, that unions are third parties, which have no business getting between a corporation and its employees. Typically also American corporations see their employees as ‘other’ from the corporation. Amazon is not just a mail-order retailer, but also a logistics company, a media corporation, an IT provider, and a hardware and software manufacturer. The company will soon operate its own air and shipping lines. Each of the corporation’s eight German fulfillment centers operates as a separate company. Although the same holding company in Luxemburg — one of Europe’s prime tax havens — owns them all, separate executive boards allegedly control each. No one has challenged this curious legal construct in court, which makes collective bargaining on behalf of all twelve thousand Amazon employees, legally speaking, impossible. Further, Amazon has so far managed to avoid being classified as a corporation in Germany, thereby dodging the country’s mandatory works councils. Amazon’s corporate structure makes it almost impossible for workers to unite against management. Moreover within the European single market it has shown its readiness to set up in Poland and the Czech Republic, with the assistance of EU subsidies, with the singular purpose of servicing the German market and thus avoid any inconveniences emanating from German law. Germany should worry about this. So should the EU and so should we. Here we have an entity presenting as a corporation, which has the rights of a natural person under American law. Under our trade deal with the US Amazon has those rights here, which exceed the rights of Australian citizens. Yet when challenged legally it disappears into the mist. What chance do you think that this entity will ever pay tax in Australia? In my opinion, a civilised society of the future depends on governments being able to domesticate and civilise corporations. That is sine qua non. Amazon appears to have created an entity that is beyond the reach of any government outside the USA. This is very concerning on several fronts. Firstly I reckon our government will cave to Amazon. They have a poor track record of resisting forces of any sort, especially sensibilities. Secondly, as we see with energy policies, there are powerful shaded entities at work, scripting our government responses. Doubtless Amazon has its own team that may have been at work here for some time. Who are they and what tentacles have they constructed? Thirdly as Brian says, they may not be accountable to an Australian government. Fourth, there has been much said about tax havens and the need to crack down on them. Yet here comes Amazon with an established tax haven structure designed to evade tax. Is that OK? Meantime, my Adobe and Netflix subscriptions now attracts a gst component; part of the tax crackdown or maybe it is responding to reasonable retailers complaints, but I am paying more tax. Fifth, if the impacts are as profound as described, what of the local effects of Amazon on industry, workers, families and disposable incomes. That suggests an imposition on our welfare structure. Sixth, the fulfillment centres (sounds like something the Rev Jim and Tammy Baker would have loved) will generate some interesting logistical issues. Additionally, they are likely to concentrate on the eastern capitals first. What impact that might have on regional areas is hard to measure but since I live regionally I am not hopeful that Amazon would be to ur advantage. The impacts of Amazon might not be in our best interests. Will our government watch our backs? And will we as consumers also eschew the behemoth? I think our record is that we take the easy way out and buy the cheap options then complain. And trade agreements – does the US still respect those? 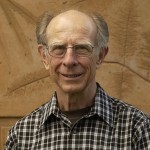 Geoff, I think we’ll probably welcome Amazon, because we’ll get cheaper prices, and added convenience with efficient and reliable home delivery. But shopping strips and centres will be less vibrant places. We’ll regret that but not connect the two. We only go to places like JB Hi-Fi and Harvey Norman occasionally. When we do, if they are still there, we’ll have a reduced range of goods on display, and less help to make what are for people like me quite complex decisions. Revenue to government may be down, but the money we save may go into spending on other services if we don;’t use it to buy more stuff from the likes of Amazon. Generally trade deals have been written in favour of American industry, in spite of what Trump tells you, and the WTO is the only external organisation in the world that the US respects. But cases have to be brought, and our government is slack in protecting our interests. Thanks Brian. I’m still very cautious about the net worth of Amazon to the community. Cairns put in a great “Central Mall”, a real showpiece for the area. That was fine for shopping convenience but was devastating for the small traders that populate the surrounding streets. The result has been very little investment by those businesses so that those areas became dowdy and unattractive to locals and tourists. It’s only fairly recently that some new life seems to be stirring. 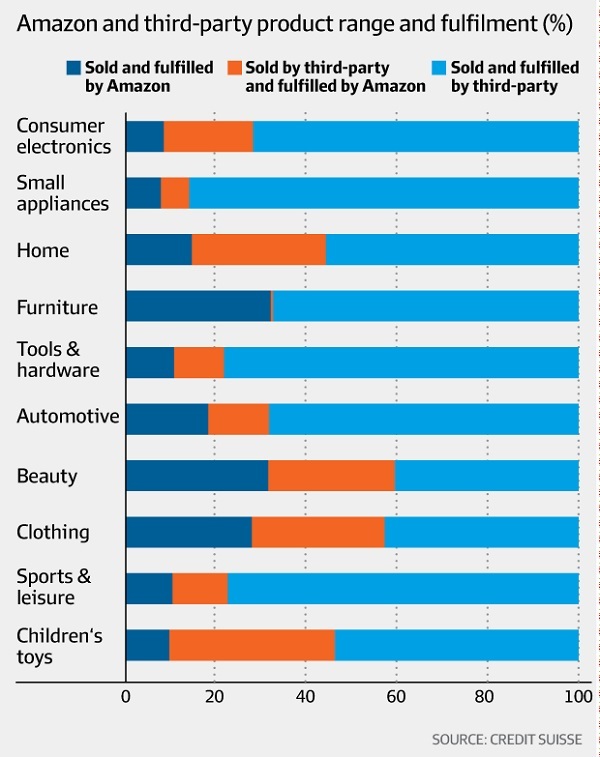 I suspect that Amazon will have an unhealthy effect upon many businesses. True, some businesses only survive because they over-charge rather than invest. But overall I am concerned that the damage will be deep. I can’t muster too much of a warm fuzzy feeling about Amazon. I’m not sure they are in our best interests. Geoff, Amazon’s focus is very clear. They are, at last call I saw, the fourth largest corporation in the world, and the CEO is looking to be the richest, if he’s not already there. We already contribute around a billion dollars a year to their revenue. Problem is, there is likely to be no event that will cause any alarm to our politicians – they’ll just see it as the process of modernisation. When they realise that Amazon will pay no tax, someone will order an inquiry or we’ll have a senate investigation, but if the German experience is anything to go by nothing will be done, because the ‘corporation’ simply disappears. The US was never really serious about solving this tax haven thing, because American democracy is the best that money can buy. Obama didn’t do it, Bernie Sanders may have. Similarly Amazon will exploit our industrial relations system, because even Labor is not game to level the playing field. There may be some good jobs where they have to pay for skills, but they’ll probably use casualisation to the max. Part of the potential problem is that Australia’s contracted labour laws are inadequate and/or poorly enforced. Which makes it easy for companies to avoid providing reasonable working conditions. Parts of the rural industry is calling on the federal government to lift its game in this area to avoid an unfair advantage being given to cowboy companies. Maybe industry in general might be better able to handle the Amazon’s of the would if labor and competition laws were more effective and enforced. One wonders if those who were forced out of business by the rise of Harvey Norman are having a quite chuckle. The trick with Amazon may be to separate the good ideas and better ways of doing business from questionable approaches to business. And we vote on Perceived Value, Price is only 1 factor in accessing Value. That’s why Free Trade is the most Democratic system. as far as actual Democracy goes, I prefer one elector = 1 vote. and what about immigration, Mr J. Should everyone just be “voting with their feet”? Simply put, a purchase offerings Value is like a policy, the more policies on offer the better, the policy most voted on wins the day. The competition tries in future tries to make a superior policy or fade away till they do. Every transaction is a vote. 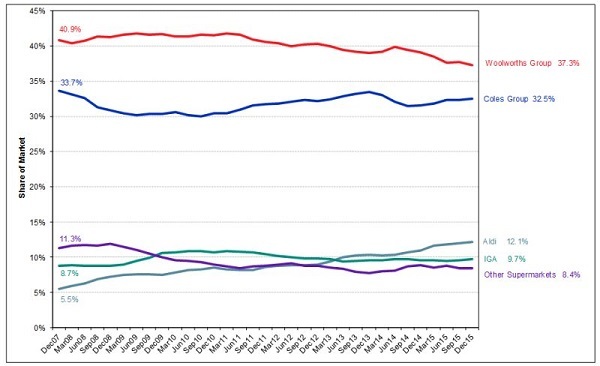 Billions of Referenda occur every day. Who are we to corrupt Democracy to better our personal preferences ? That’s a good question Mr A, but it’s relevance to Amazon is what exactly ? relevance: at 3.23pm you cited “being Democratic” as a criterion on which different trade regimes might be judged……. though most of your comment seems to relate more to “the sovereignty of the consumer” (rather than trade, as such). Amazon is another matter, Mr J. You do come here for sustenance and polite debate, si? Wouldn’t call Nth Korea an example Free Trade or Democracy, but please, do elaborate. I want to know which unicorn this “Free Trade” chappie is riding. The trick with Amazon may be to separate the good ideas and better ways of doing business from questionable approaches to business. People can certainly learn from the way they provide services, but it seems there is no way of bringing such corporate entities to account unless there is an internationally agreed standard. There seems little chance of that. you’d buy that dream, eh. what could possibly go wrong…. Every purchase is in fact a vote. Christoph, that calls to mind the expression that we vote with our feet. So when we don’t, effectively it is a vote of support.